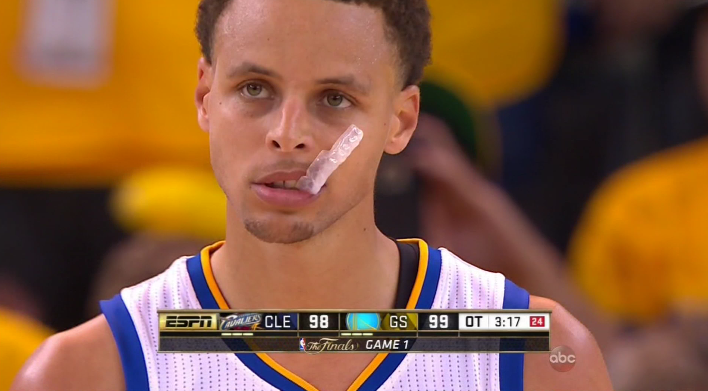 2015 NBA Finals: Stephen Curry and LeBron James chew mouth guards. Michael Jordan chewed gum. What happened? 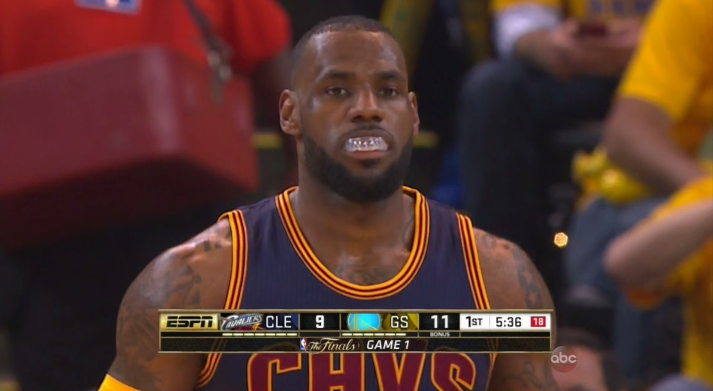 When did NBA stars stop chewing gum and start chewing mouth guards? Cleveland Cavaliers star LeBron James poses for photos during a Bubblicious bubble-blowing contest in Times Square on July 8, 2004, in New York City. As the seconds ticked down in Game 1 of the 1998 NBA Finals, the Chicago Bulls were desperate for a game-tying three at the end of overtime. The final shot attempt came from Scottie Pippen, a wild look from well beyond the arc, and it wasn’t even close. As he sulked off the court in anger, Pippen reached into his mouth, grabbed a piece of chewed up gum, and slammed it to the ground in disgust. Only the slo-mo replay from NBC that followed can do the weirdness of the scene justice. Reigning league MVP Stephen Curry of the Golden State Warriors actually had his own NBA Finals Game 1 overtime chewing moment earlier this month. Unlike Pippen’s, though, this was a moment of triumph. 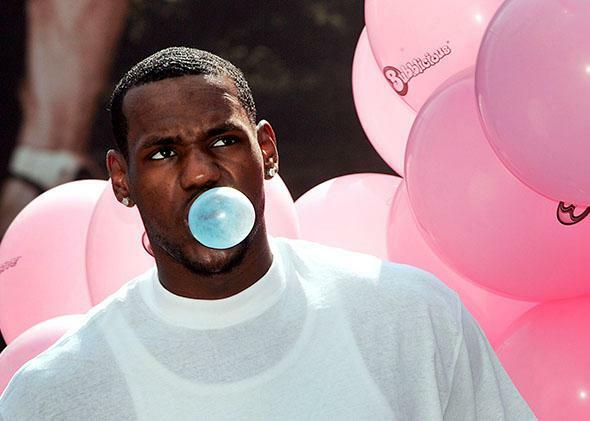 And unlike Pippen’s, no gum was involved. After nearly two tense, scoreless minutes of gameplay, it was Curry who broke the drought with a couple of free throws that kick-started his team to a series-opening victory. As he swished his first free throw, the ABC cameras caught Curry’s face, which prominently featured a gnarled, saliva-drenched mouth guard contorting from his lips. Stephen Curry of the Golden State Warriors during overtime of Game 1 of the NBA Finals on June 4, 2015. Today, the chances of a classic gum-chewing moment like Pippen’s are gone. An extremely cursory Slate investigation found that of the 10 starting players in the 2015 NBA Finals, none currently chew gum on the court with any regularity. Curry keeps a stash of packs of Gatorade Prime Energy Chews (which are very much not gum) in his locker room cubby and has been spotted chomping away during games, but strictly on the sideline when he’s resting. While on the court, he’s exclusively a mouth guard guy—and it’s just not the same. It wasn’t always like this. For the better part of three decades, before the rise of mouth guards, chewing gum was the NBA players’ mastication treat of choice. 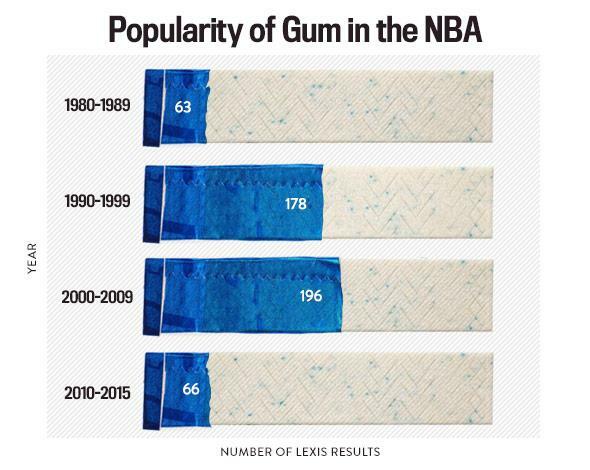 A Nexis search for the words “NBA” and “gum” in four major newspapers (New York Times, Los Angeles Times, Chicago Tribune, and Washington Post) found that the recent history of NBA gum-chewing broke down into roughly four different eras. Publications started taking regular note of the phenomenon of gum-chewing players in the 1980s, the Early Chew era; it started to really take off in the 1990s, the Jordan Era; gum-chewing peaked in the 2000s with the post-Jordan Kobe Bubble; and finally, it began its decline in the 2010s with the Mouth Guard Era. Looking at the major incidents of chewing on an NBA court over the last four decades confirms this pattern. Chart by Natalie Matthews-Ramo. Photos by iStock and Thinkstock. If gum-chewing started out in the NBA as a subtle gesture, it was Michael Jordan (who else?) who made it an act worth emulating. It was 23 years ago this month that Jordan famously “shrugged” against Portland in Game 1 of the 1992 NBA Finals, all the while chewing gum. When Jordan hit the game-winning shot in Game 6 of the 1998 NBA Finals, he was chewing his preferred watermelon Bubblicious. (After Game 1 of that series, the team had sent the Bulls’ ball boy on a frantic gum-shopping excursion across Salt Lake City.) I don’t mean to propose causation or even necessarily correlation—many of his other unforgettable plays came replete with exposed tongue, something hard to do with a wad in your mouth—but Jordan undeniably fostered the association between the look of rapid, repetitive jaw movement and basketball excellence. Others followed, of course. For his nearly 20-year career, Shaquille O’Neal claimed to have chewed four pieces of Big Red gum before every game and then stuck it under his chair on the sideline for safekeeping. (Factor in the playoffs, and that’s more than 5,600 Big Reds for the Big Aristotle.) Kobe Bryant, O’Neal’s former teammate in Los Angeles and also the closest analog we’ve had to His Airness since Jordan retired, could stare down the threat of a basketball fired straight to his face so long as he had a wad in his mouth. Allen, who sat out this past season but hasn’t officially retired, was among the last big gum chewers to bridge the Kobe Bubble and the current Mouth Guard Era. In the past few years, mouth guards have even replaced gum as NBA players’ projectiles of choice. Back in December, Utah’s Enes Kanter was fined $25,000 for throwing his mouth guard at some fans in Sacramento. This harkens back not only to Pippen’s hurl in 1998, but less benign gum-tossing moments. Hall of Famer Reggie Miller was fined $10,000 and suspended for a game in 2001 for tossing his gum at the back of a referee’s head. Paul Pierce—another player whose habit stretched across eras—was fined $15,000 in 2011 for lobbing his chew at a fan sitting near the court. The list of infractions goes on and on. In early 1987, Gary Payton was just a freshman at Oregon State when he commemorated his first Civil War game against Oregon by throwing his chewed-up gum (four sticks of Doublemint) at a Ducks cheerleader who supposedly called him a name. Sports Illustrated wrote about the incident, and Payton, according to the Eugene Register-Guard, was prohibited by his coach from chewing gum in the rematch. Perhaps it boded well for Payton (and his future Hall of Fame point guard career) that he was able to launch a lump of gum from 20 feet away and still nail a cheerleader square in the face. Not so much these days. A decade after being paid millions to chew gum for a Super Bowl commercial, James has now fully transitioned to mouth guards. 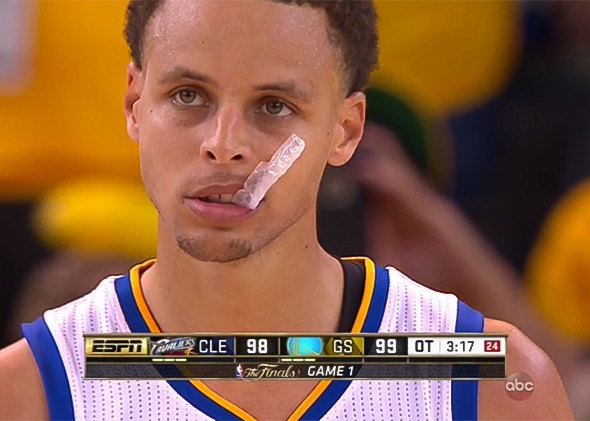 In these finals, he’s joined in the mouth guard camp by Curry and new Cavs starting point guard Matthew Dellavedova. Some teams, like the Oklahoma City Thunder and Washington Wizards, seem intent on sticking with the bubbly stuff, but the rise of mouth guards has undoubtedly come at the expense of gum. LeBron James during the second quarter of Game 4 of the NBA Finals on June 11, 2015. But purported health benefits—that they help reduce the occurrence of concussions and other traumatic brain injuries—are not yet fully scientifically proven. A peer-reviewed study last year from the Academy of General Dentistry looked at more than 400 high school football players and did find that custom-fitted mouth guards helped reduce the occurrence of traumatic brain injury, but the benefits for players that wore over-the-counter mouth guards were harder to find. And the 2013 Consensus Statement on Concussion in Sport, published by a group of 32 leading researchers, went a step further and declared that the use of mouth guards and other forms of protection, such as helmets, can often result “in behavioral change such as the adoption of more dangerous playing techniques.” That’s certainly an interesting conclusion for anyone who has watched Dellavedova’s reckless, injurious play during this postseason. As far as any perceived benefits of gum-chewing, researchers at Tokyo Dental College, in a 2008 study published in the International Journal of Sports Dentistry, found in a small sample size that gum-chewing “shortens the body response time” and “may also provide a significantly positive effect on performance in sports.” But there is otherwise scant research to support that claim. Some newer research does show that consuming caffeinated gum right before a competition may help boost your efforts. Even though the medical evidence is sparse at best, there’s big business in mouth guards, as there used to be in gum. Curry probably didn’t get as much money as James did for the Bubblicious deal, but he did lend his name to a line of flavored mouth guards from MoGo back in 2012. A taste test by BuzzFeed was a mixed bag, with the bubble gum–enhanced guard reminiscent of “that stuff you get at the dentist.” That’s not exactly the sort of flavor you’d imagine wanting on the basketball court, and Curry is now conspicuously absent from the company’s website. Endorsement contracts and injury prevention aside, there’s some modicum of data that shows a real impact on at least one player’s shooting performance when that gangly piece of equipment is protruding forth. The Wall Street Journal analyzed video footage and found that Curry shot 64 percent of his free throws this season with his mouth guard sticking out—and that his percentage with it out was higher (.925) as opposed to when the mouth guard was properly stowed away (.894). The latter mark would’ve placed him sixth in the league in free-throw shooting, but the display of public gnoshing helped place him as the league’s best shooter from the charity stripe. 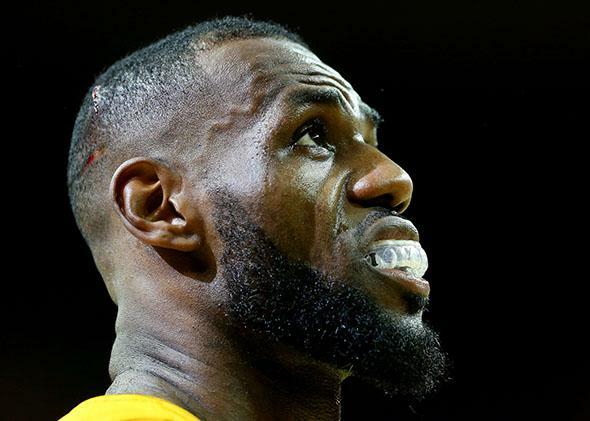 Regardless of who prevails as champion, Curry and LeBron have helped cement the mouth guard’s place in NBA culture, much to gum’s enduring detriment. This rising swell in popularity could be here to stay for years—or yet another bubble ready to pop.